EVERY DAY, TheJournal.ie brings you a round-up of the day’s main news as well as the bits and pieces you may have missed. And with that, they were gone. Queen Elizabeth and Prince Philip are back in London this evening as their four-day trip to Ireland ended with stops in Cashel, Fethard and Cork. 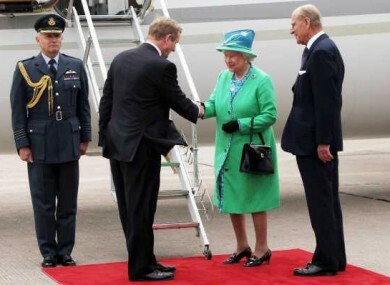 Leaving Cork airport this evening – having been seen off by Taoiseach Enda Kenny, who flew down specially to see her off - the Queen told Kenny that she would like to return to Ireland at some point in the future. If you didn’t catch it last night, Olivia O’Leary’s reading last night at the National Convention Centre, you really should read the full transcript – it’s quite something. Did you know that Not Cardinal Sean Brady was at the dinner on Wednesday? He was – and he’s written about it. It’s the final time we’ll do this, so here – in full recap – are our selection of photographs from Day 1, Day 2, Day 3 and finally Day 4 of the Queen’s visit – and the best tweets from today too. Both the Department of Foreign Affairs and the Gardaí have refused to issue full details on the visit of President Barack Obama to Ireland next Monday – probably waiting until Sunday to issue details. Tributes have been paid today to the late former Labour TD Michael Bell, who died this afternoon. The Department of the Taoiseach has opened an online book of condolences for the late Dr Garret FitzGerald, who died yesterday. Rosanna Davison has appeared in the High Court today over claims that Ryanair branded her a ‘racist’. Davison told a newspaper in 2008 that it was a shame Ryanair hadn’t included any Irish models in its annual calendar for that year – and Ryanair responded with a damning press release. UCD economist Karl Whelan has warned that Ireland won’t be in a position to borrow from the world’s markets next year, as was first hoped – and as the waters get to our heads, we’re going to need a bigger bailout. The IMF is less critical, however, claiming that Ireland’s bailout plan remains on track – though the Eurozone needs to be more flexible in dealing with each country’s own issues. Do you use Twitter? Have you speculated about the identity of the Premier League footballer behind a superinjunction over an affair with Imogen Thomas? Congratulations – the footballer might be trying to sue you. Chinese people are being offered a ‘taste of Ireland’… if they go to KFC, who are promising to lace chicken with a Bailey’s-style liqueur.